I browse this Steak recipe from a Facebook page and gave it a try after modify it. No doubt I got a nice taste and texture. 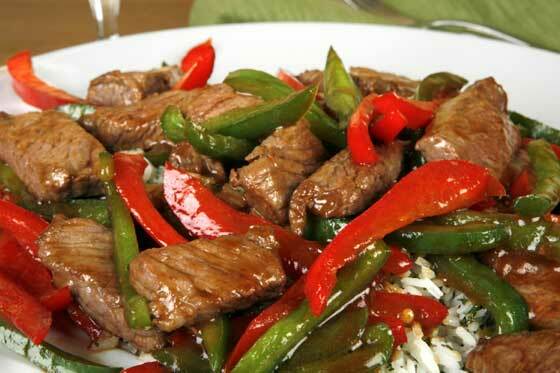 Pepper Steak is a delighted meaty dish and goes fabulous on bed of boiled rice. Combine cornflour, red chili sauce, garlic and soy sauce in a medium bowl. Add steak, mix to coat, cover and refrigerate for 2-3 hours. Remove the steak from the marinade, reserving marinade. Melt butter in a large skillet over medium high heat and brown steak in the butter. Add the marinade and broth, reduce heat and simmer covered for 1 hour. Stir in the onion, pepper and tomatoes, and simmer uncovered 10 minutes while occasionally stirring gently. Serve over the cooked rice. 1. کارن فلور،لال مرچ ساس ،لہسن،سویا سوس کو ایک درمیانے سائز کے باول میں مکس کر لیں.اسٹیک ڈال کر مکس کر یں تاکہ اس پر تہ لگ جاۓ.ڈھک کر دو سی تین گھنٹے فرج میں رکھ دیں. 2. اسٹیک کو میری نیڈ سے نکال لیں،میری نیڈ کو رکھ لیں. 3. مکھن کو ایک بڑے پین میں درمیانی آنچ پر پگھلا لیں.اور اسٹیک کو مکھن میں سنہرا کر لیں. 4. اب اِس میں میری نیڈ اور بیف کی یخنی ڈال دیں، انچ ہلکی کر دیں اور ڈھاک کر ایک گھنٹے کے لئے پکنے دیں. 6. تھوڑی دیر بعد آہستہ آہستہ چمچ چلائیں. .پکے ہوۓ چاولوں کے ساتھ پیش کریں.